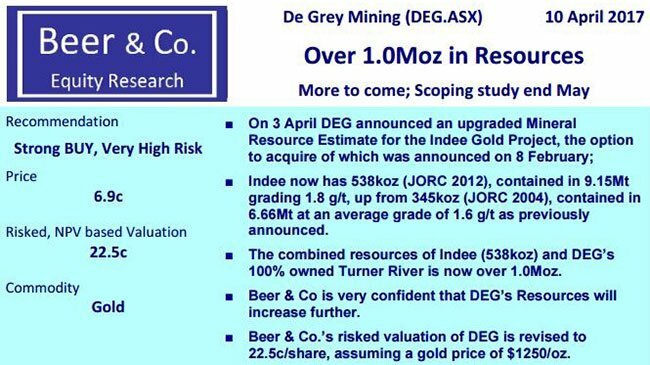 De Grey Mining Ltd (ASX: DEG) has zeroed in on a neat asset in WA that has gradually raised its head above water, as gold prices have gone above A$1,600/oz. 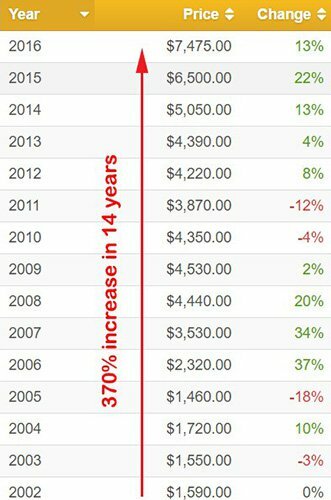 Since January, spot gold prices have risen by around 19% and when priced in Australian dollars, they have reached their all-time record highs above $1,800 back in July this year. 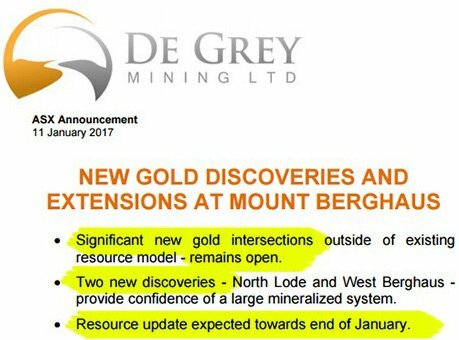 ...and having seen DEG step up its activities in gold-rich WA, it could be a good time to go fishing for tiny gold explorers in strong gold-bearing locations. DEG’s Turner River Project located in the infrastructure rich Pilbara region of Western Australia, already has a 406,000 Resource defined with the final pieces of the exploration puzzle now almost complete. As soon as DEG completes its latest round of drilling, it plans to progress as quickly as possible into publishing its Turner River Scoping Study. 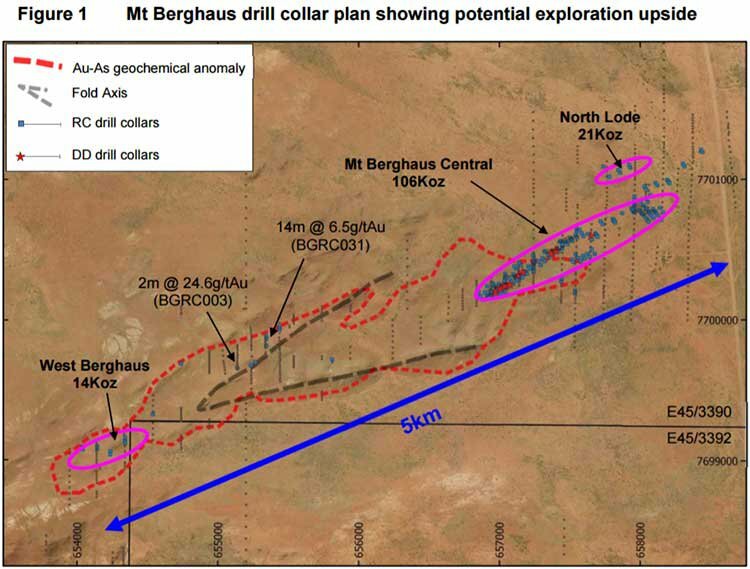 DEG’s prime asset is Wingina Well with early indications showing two well-defined parallel lodes indicating high gold mineralisation at depths of 200-500 metres. DEG’s drill bit has recently gone as far as 450m and the early indications are that Turner River is well endowed at greater depths. The ultimate plan is to raise the overall Resource at Turner River from its current 406,000oz and construct and commission a processing plant at Wingina. As gold prices have stepped up their game, now could be the time to look for a bright junior with colourful metals assets in its locker. Aside from having a 100% owned gold resource at Turner River, DEG has also drawn a strong base metals and lithium card. 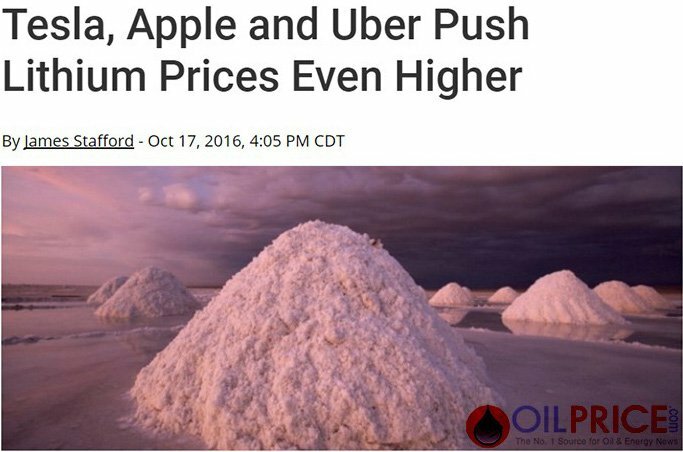 As we’ve all seen by now, lithium is experiencing the sharpest short-term price gains compared to any other commodity. DEG recently completed surface analysis of rock chip samples along a new and highly prospective 7.5km long King Col Pegmatite trend also at its Turner River Project which defined high grade lithium up to 4.22%. These are encouraging results, especially when compared to the $640M Pilbara Minerals world class Pilgangoora Lithium and Tantalum deposit, with the numbers stacking up nicely. ...but with one single objective: to grow DEG’s Resource portfolio in order to raise its valuation for shareholders. The long-term goal is to fully assess its geologically open gold asset to see just how far the rabbit hole goes. 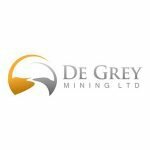 De Grey Mining (ASX:DEG) is a multi-metals explorer operating in the Pilbara region of Western Australia (WA). It recently secured 100% ownership over gold tenements that have the potential to breathe commercial life into this undervalued explorer. Despite seeing a cavalcade of high-grade gold and VMS-style mineralisation results, DEG remains valued at around AU$11.5 million, priced at $0.03 per share. This could present an imminent re-rate opportunity when you consider that DEG is diving two-feet first into explorative drilling. Whilst the company has recently drilled at depths beyond 350m, with historical exploration data helping to narrow down DEG’s exploration targets, the next round of drilling will be chasing oxide resources at a relatively shallow depth. DEG recently raised AU$1.26M in an oversubscribed share placement at a price of $0.0029 to continue its exploration endeavours. Existing shareholders will also be invited to participate in a Share Purchase Plan (SPP) to raise an additional $1.25M under the same terms as the placement. The price represents an 18% discount to the volume-weighted average share price of DEG’s shares over the last 5 trading days up to an including 14 October. A total of 431 million shares are on offer under the SPP and a complete timetable will be announced shortly. The funds will be used to continue work at Turner River including drilling at Mt. Berghaus to increase and upgrade its resource base. Soil sampling will be undertaken across the King Col pegmatite trend and the new Wallareenya Gold Target to identify further drill targets. Ongoing structural work will be conducted to improve geological understanding of shear zones whilst long lead feasibility studies will be initiated. 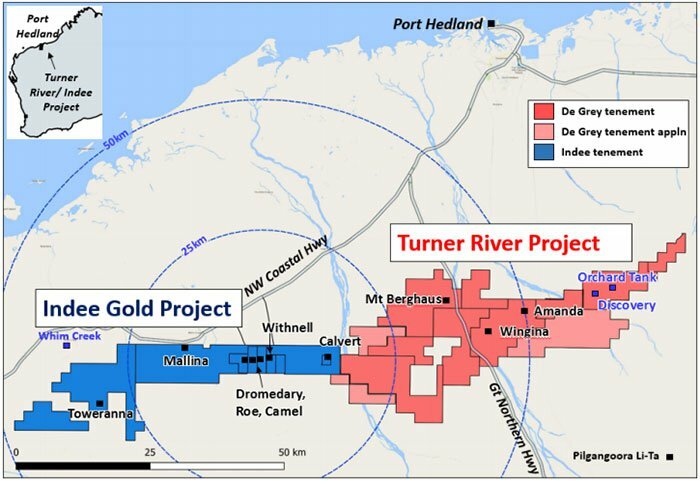 Here is a quick summary recapping all the gold highlights of DEG’s flagship Turner River Project which DEG took into 100% ownership earlier this year. The Turner River Gold project is outlined in purple — this is the site from which DEG plans to be producing its trickle-come-torrent gold-bearing ore considering the strong Resource it already has, in addition to the gold mine it may have deeper down at Wingina Well (more on that later). Outlined in blue to the east of Wingina Well is DEG’s base metals option where DEG has picked up strong geological indications that it can also step into zinc production in parallel to the precious metals being excavated next door. Marked in green dots, are VMS prospects which DEG is also pursuing. If we drill down into the nitty-gritty Resource data, we can see that DEG already has a JORC Resource to the tune of 406,000 oz. gold, spread across several prospects. The most high-profile project at Turner River is Wingina, both because of its individual comparative size and accompanying grades. The gold in the Inferred category relates to deeper portions of the deposit which have had less drilling activity in comparison to shallower regions. Wingina constitutes over two-thirds of the entire Turner River deposit, which is probably why DEG has focused most of its near-term explorative attention on Wingina, and more specifically Wingina Deeps. A full-scale diamond drill programme was recently completed at Wingina Deeps — initial results have been encouraging with grades reaching as high as 13.80g/t from 419m. This is significant because DEG has earmarked a protracted attempt to source more gold from depths >250m. It is important to reiterate here that shallow oxide drilling has been successful in confirming the high grade nature of the definition of strong high grade lodes within Wingina. Admittedly, there have been some drilling difficulties and variable recoveries throughout DEG’s drilling programme at Wingina, but the good news is that the holes that were completed are returning a strong foundation from which to build operations and cash flow. The fact that the spot gold price has made historic highs, and remains elevated above $1,600/oz. may suggest DEG’s Turner River project may not have to be a large and expansive as first thought to become economically viable. DEG’s drilling has encountered high-grade gold mineralisation, across several prospects — so much so, that its results have advanced DEG towards its end-goal of defining a solid Resource at Turner River and jump into Feasibility studies as soon as reasonably possible. Here’s a summary of DEG’s planned exploration programmes at Turner River. One other very noteworthy aspect of DEGs Wingina gold is that it showing a 94.7% recovery rate when processed. That could be a hidden gem in itself and may suggest the gold in DEG’s tenements is of a fine quality. The Wingina deposit will most likely be developed as an open pit and underground mining operation with additional ore sourced from satellite open pits — Mount Berghaus @ 43,000oz), Amanda @ 35,000oz and Discovery @ 33,000oz — within economic trucking distance. The 90%+ recovery rate is fairly uniform amongst Pilbara gold millers, which means DEG only has to get the simple things right to progress from explorer to revenue-generator. ...and there’s one anomaly piquing interest. The image above shows three separate gold lodes that DEG is particularly interested in exploring further. DEG will determine if the three high grade shoots extend at depth into the fresh bedrock, and whether they have sufficient tonnage/grade to support economic underground mining via a decline below the proposed open pit. Selected drilling is planned to test the extensions of these shoots and to determine the grade and width of mineralisation in the fresh bedrock. Should exploration results prove to be positive, DEG intends to fast-track efforts toward undertaking an updated scoping study. Of course, as with all minerals exploration, success is no guarantee – consider your own personal circumstances before investing, and invest with caution. Take a look at this cross-section view of the same gold lodes, only this time with drill holes indicated in black dots. DEG is currently considering two different mining methodologies at Turner River. 1. Standalone centralised CIL processing plant with ore supplied from a staged initial oxide open pit at Wingina Well, progressing to selective underground mining of the higher grade plunging shoot(s) at Wingina Well, supplemented with low grade stock piles and various nearby satellite open pits within a radius of 25km trucking distance. 2. A standalone centralised processing plant with only oxide ore supplied from Wingina Well and various nearby satellite open pits within a radius of 25km trucking distance. Investors always like to stop in and see what a stock like DEG could one day evolve into. In DEG’s case, comparison should be made with Pantoro Ltd (ASX:PNR) and Doray Minerals (ASX:DRM) – pre-discovery of course. Pantoro and Doray indicate the path to success and are stocks that DEG would do well to emulate over the coming months, assuming it can continue to define a quality, commercial gold resource. 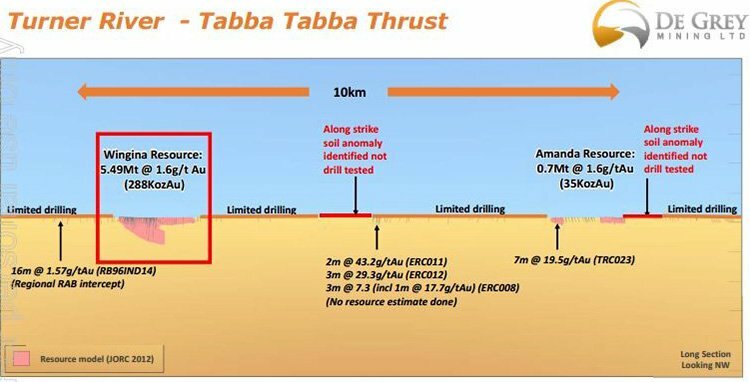 The Discovery deposit is a 1.2Mt VMS-style of gold, silver and base-metals. At Discovery, DEG has 2.34% zinc, 87g/t silver, 0.94% lead and 0.8g/t gold. DEG has also discovered the 1.7Mt Orchard Tank containing 2.38% zinc, 78.6g/t silver, 0.99% lead, 0.06% copper and 0.27g/t gold. VMS deposits are thought to account for 20% of the world’s copper and zinc production, with their cluster-forming tendencies making them very lucrative deposits if an explorer is able to get a read on the irregular geology. The good news is that DEG has some very encouraging drill results which open this VMS option for DEG. In close proximity to Discovery is Venturex Resources (ASX:VXR) and its Sulphur Springs, Liberty-Indee and Whim Creek deposits. Venturex’s recent exploration is now at the feasibility study stage with mining options being assessed for a 7.6Mt @ 1.7% copper, 4.3% zinc and 17.3g/t silver resource. DEG will hopefully be able to prove up a Resource of its own, and emulate VXR’s progress. Clusters of VMS deposits have been confirmed to sit beneath both Orchard Tank and Tabba Tabba, both are DEG’s prospects at Turner River, and both offer something unique to the DEG asset portfolio. DEG has obtained ground over a 7.5km long prospective lithium trend with Li 2 O to 4.22%, down the road from the Tabba Tabba mine and the $640M-capped Pilbara Minerals. DEG has a fairly bulky 900km 2 land holding within Australia’s richest lithium-bearing region and has more license applications in the pipeline. One such catalyst was a recent new pegmatite trend discovery at Tabba Tabba, DEG’s lithium asset in WA. Recent drilling results yielded a peak result of 4.22% Li 2 O, and an average of 2.5%-0.15% Li 2 O at Tabba Tabba. Although these are just an initial dabble into lithium, an early 4.22% Li 2 O hit is very encouraging and raises the prospect of DEG tapping the same lithium mineralization as nearest lithium peer — Pilbara Minerals (ASX:PLS) — with a 128.6Mt @ 1.22% Li 2 O Resource. Further to this, DEG recently conducted surface reconnaissance rock chip samples which reported high grade lithium and additional highly anomalous results. The sampling was undertaken along a newly discovered 7.5km zone of relatively sparsely outcropping pegmatites. This new trend has been labelled King Col Pegmatite Trend. 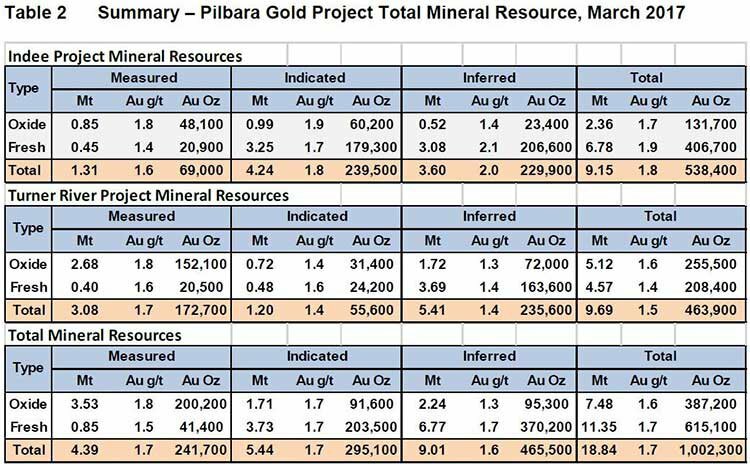 Results are encouraging and could put it on the same path as Pilbara Minerals with its Ta 2 0 5 which sits at 138ppm from a significant JORC Resource. Bear in mind, DEG’s results are from rock chip sampling at this stage. DEG is committed to advancing Tabba Tabba towards a lithium resource, and plans to define anomalous target zones and commence drill testing as early as this month to complete all outstanding work before the Christmas break. Could we see an early Christmas present from the crew over at DEG? We’ve got our stockings ready just in case. Considering that DEG is a gold explorer on a track for gold sale revenues, with a base metals kicker — to then have lithium added for good measure is a superb supplement to this battle-hardened explorer’s arsenal. Admittedly, DEG’s lithium exploration is secondary to its gold and base metals work, but Tabba Tabba could potentially offer up something interesting for shareholders later down the track, especially when you consider that DEG has only assessed 5% of Turner River for lithium . The Turner River Project has been overlooked for many years, but now could be the time to leverage metals market rejuvenation to put this asset back into play. At current gold prices Turner River represents an excellent development opportunity particularly as it is already 100% owned by DEG. Previous mining studies provide strong support for at least a simple oxide open pit mining strategy. Additional planned drilling could show that an underground mining extension may be possible. This may extend the proposed mine life significantly. 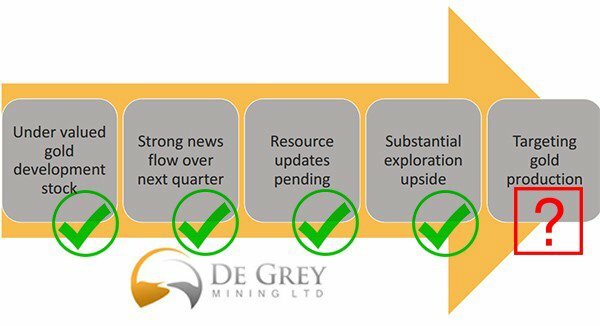 DEG has a decent 406,000oz gold resource to get it started, and some excellent base metals ground work to provide a good level of confidence that this undervalued explorer can raise its valuation over the coming 6-12 months. To put recent gold market/gold explorer valuations in perspective, take a look at this chart from Bloomberg showing the comparative changes of gold producers and spot gold prices. ...gold producer valuations are off to the races showing an average gain of 132% year-to-date. As gold prices generate more headlines and there is visibly higher demand for this precious metal across a spectrum of industries, investors could do worse than backing a tightly-knit efficient gold explorer with a strong base metals option to fall back on, as it goes on a quest for considerable upside. DEG fits that bill pretty succinctly given its array of metals endowments and extensive drilling efforts to move into production as soon as possible. Given that investors are so forward-looking nowadays, they could well be looking forward to DEG progressing its Turner River project, while gold demand continues to progressively improve operating margins for gold producers.